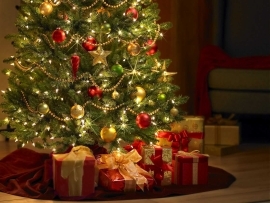 French children put their shoes in front of the fireplace hoping that Père Noël (Father Christmas) will fill them with gifts and in the morning they also find that sweets, fruit, nuts and small toys have been hung on the tree. Originally clogs were placed by the fire which is why it is common to see chocolate clogs in many patisseries. Naughty children are threatened with a visit from Pere Fouettard who will spank them, coupled, no doubt, with the threat that Père Noël might not come at all. Rather quaintly, a law was passed in 1962 stating that all letters posted to Father Christmas must receive a reply. Presents are generally exchanged on Christmas eve and cards are given on New Years day or le Jour de l'An. 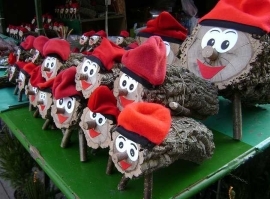 Another Christmas tradition from the Catalonian southern part of the Languedoc-Roussillon, is the Tio de Nadal or cachafuoc - pooping log in English. From the 8th December (the Feast of the Immaculate Conception) the hollow log is fed every night and covered with a blanket. Depending on family traditions, the tio is partly put into the fireplace on either Christmas day or Christmas Eve and then it is beaten with sticks while singing traditional songs until it 'poops' out goodies such as sweets, dried fruits and nuts. When it has finished, the last thing it poops out is either an onion, a head of garlic, or salt herring. The pooped out delicacies are then shared by everyone. Traditionally, Midnight Mass (la Messe de Minuit) is attended followed by a huge feast called le Réveillon (from the verb réveiller, to wake up or revive). After Réveillon, it is customary to leave a candle burning in case the Virgin Mary passes by. Oysters are traditionally served with about 50% of the annual oyster production being consumed during the festive period (see our serving suggestion with our article about oysters). A traditional log-shaped cake called the buche de Noël, which means 'Christmas Log' is also served made of chocolate and chestnuts. This is representative of the special wood log burned from Christmas Eve to New Year's Day which, in days of old, part was used to make the wedge for the plough as good luck for the coming harvest. See our recipe if you want to make one of these. 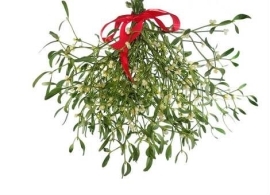 French Christmas decorations tend to be the sapin de Noël (Christmas tree) and Mistletoe is hung above the door during the Christmas season to bring good fortune throughout the year. 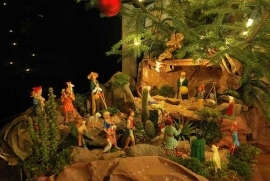 Many homes also have a crèche depicting the Nativity scene with figures called santons or 'little saints'. New Year's Eve on 31st December is called la Saint-Sylvestre and is usually celebrated with a feast, called le Réveillon de Saint-Sylvestre. The feast tends to include special items like champagne and foie gras. At midnight, everyone kisses under the mistletoe and offers their best wishes for the new year sharing their New Year's resolutions and exchange cards and gifts. 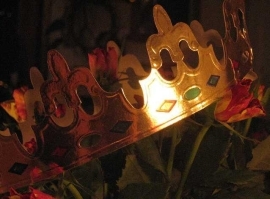 The end of the holiday season is Epiphany or Twelth Night on 6th January and is called la fête des Rois. Traditionally a cake called la galette des rois or the cake of Kings is offered with a fève or charm hidden inside and is supposed to bring good luck and fortune for the year ahead. Who ever receives the portion containing the charm gets to be King or Queen for the rest of the day.